Last week our CEO, Mark Matthews presented at CompTIA's Regional Meeting (Birmingham) on 'How to define values within the organisation', sharing his views on the importance of company values and how ATG identified their own. In this presentation, Mark gave insight into why your business values need to represent the existing team and NOT be based on what the CEO deems as important. An example of this was a stray crisp packet which was left at the entrance and passed by every employee. As a CEO Mark couldn't understand why no one picked this up, questioning if anyone even cares about the presentation of the building! The revelation was that there was no universal culture or values instilled in the employees neither of them shared a mutual vision. Mark's presentation was so well received that the event facilitators had to change rooms to accommodate for the number of people who turned up. If you'd like to keep up-to-date with Marks up-coming talks and conferences you can follow him on Twitter at @thecrispguy. Alternatively, you can connect with him on LinkedIn at Mark Matthews. Throughout the presentation, Mark referenced the book 'Traction: Get A Grip On Your Business' which altered his view on company values. 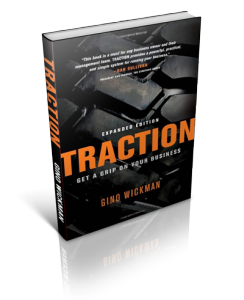 'Traction' is a business strategy book written by Gino Wickman that guides leaders of entrepreneurial organisations on how to gain control of their business through the Entrepreneurial Operating System. 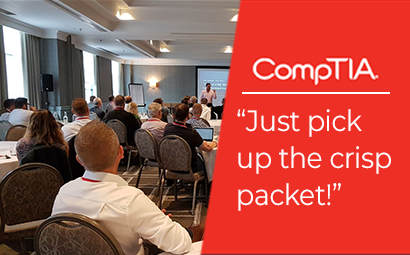 The presentation was held by CompTIA at their Regional Meeting in the Hyatt Regency Birmingham. CompTIA which stands for the Computing Technology Industry Association is a non-profit issuing professional certification for the information technology industry. CompTIA is considered one of the IT industry's top trade associations. If you'd like to find out more about developing business values or advice on developing a healthy working relationship with employees/stakeholders feel free to drop Mark a message on LinkedIn as he’s always happy to help.